CN 558419 is a good example of a relatively modern 50′ high-cube boxcar. 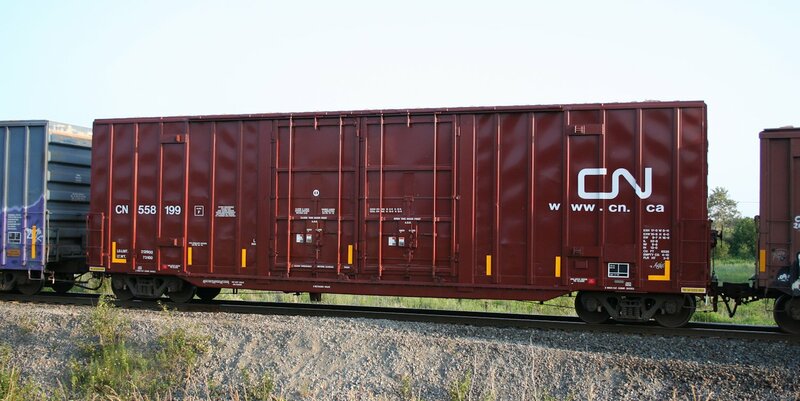 With the double sliding doors, this is a design pretty commonly used in forest products service, and is likely an empty for loading at the GP Flakeboard mill in Sault Ste. Marie (located west of the Algoma Steel Mill and served by the steel mill’s railway). 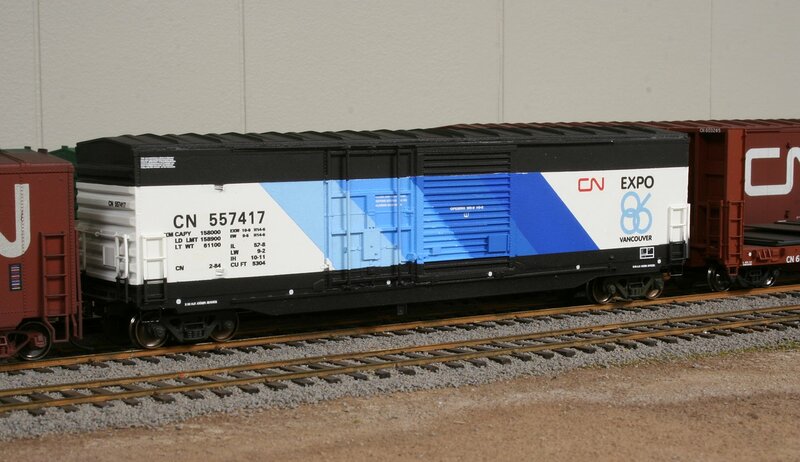 This car is one of 425 cars built new for CN in 1996 by Trenton Works of Trenton, NS. CN 558199 below is from the same series, but has clearly been re-shopped fairly recently with a fresh coat of paint and converted from sliding to plug doors. 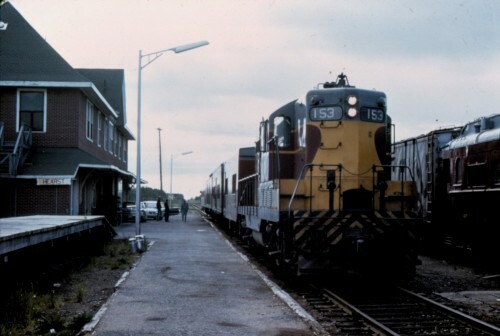 Both photos at Sault Ste. Marie, July 12, 2015. 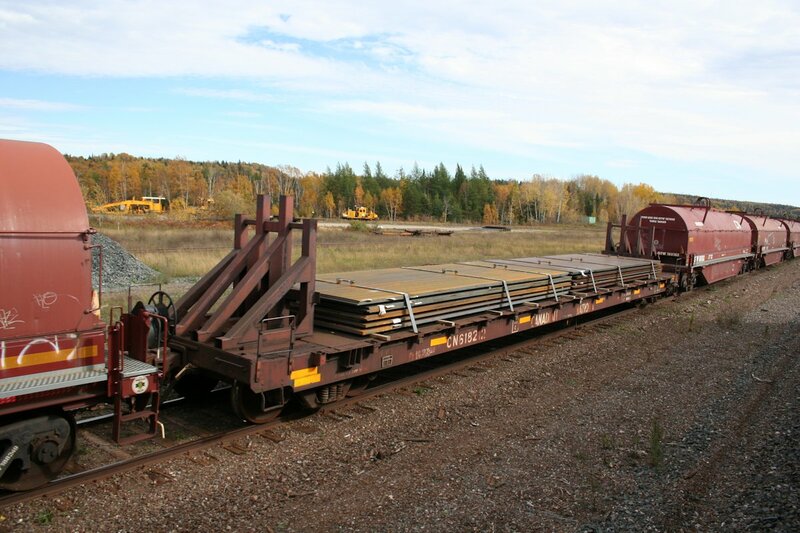 This flatcar with a load of steel plate from Essar Steel Algoma and the unusual end braces has an interesting history on CN. Originally built in the early 1970s as a rather standard 60′ flatcar, it was rebuilt in 1991 for assigned service hauling large aluminum ingots. The wood decking was removed and deck risers and the end braces were added. 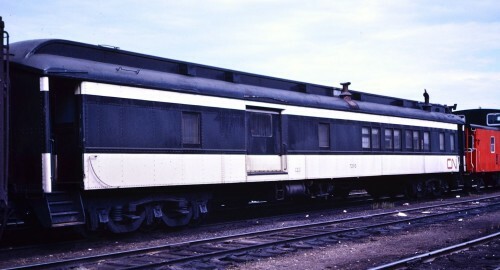 These cars remained in this service until 2011 when they were replaced by new cars built by National Steel Car and leased from Helm-Pacific. 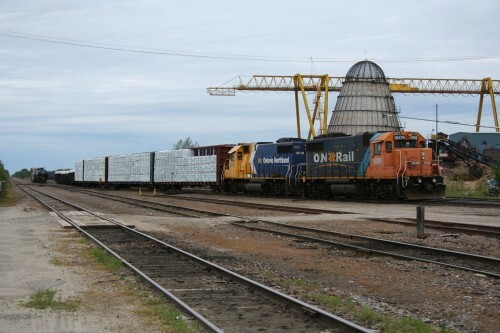 Once they were bumped from this service, CN removed the deck risers, replaced the mesh grating with solid steel decking and allowed these cars to return to general service, although they still retain those distinctive end braces from their time as aluminum ingot cars. There were a bunch of these cars kicking around on the former ACR when a friend and I rode the Tour of the Line in the fall of 2013. Apart from a couple of loaded cars in a northbound freight that we passed at Hawk Junction, one passing siding had about a dozen empties stored in it and the night before we watched the southbound freight into Michigan head over the International Bridge with quite a few flatcars. Photographed at Hawk Junction on September 30, 2013 from the vestibule of the northbound passenger train.